This article is about the area in Paris. For the Paris metro station serving it, see Invalides (Paris Métro and RER). Les Invalides (French pronunciation: ​[lezɛ̃valid]), formally the Hôtel national des Invalides (The National Residence of the Invalids), or also as Hôtel des Invalides, is a complex of buildings in the 7th arrondissement of Paris, France, containing museums and monuments, all relating to the military history of France, as well as a hospital and a retirement home for war veterans, the building's original purpose. The buildings house the Musée de l'Armée, the military museum of the Army of France, the Musée des Plans-Reliefs, and the Musée d'Histoire Contemporaine, as well as the Dôme des Invalides, a large church, the tallest in Paris at a height of 107 meters, with the tombs of some of France's war heroes, most notably Napoleon. Louis XIV initiated the project by an order dated 24 November 1670, as a home and hospital for aged and unwell soldiers: the name is a shortened form of hôpital des invalides. The architect of Les Invalides was Libéral Bruant. 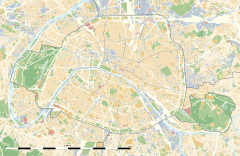 The selected site was in the then suburban plain of Grenelle (plaine de Grenelle). By the time the enlarged project was completed in 1676, the river front measured 196 metres (643 ft) and the complex had fifteen courtyards, the largest being the cour d'honneur ("court of honour") for military parades. It was then felt that the veterans required a chapel. Jules Hardouin-Mansart assisted the aged Bruant, and the chapel was finished in 1679 to Bruant's designs after the elder architect's death. This chapel was known as Église Saint-Louis des Invalides, and daily attendance of the veterans in the church services was required. Shortly after the veterans' chapel was completed, Louis XIV commissioned Mansart to construct a separate private royal chapel referred to as the Église du Dôme from its most striking feature (see below). The domed chapel was finished in 1708. Because of its location and significance, the Invalides served as the scene for several key events in French history. On 14 July 1789 it was stormed by Parisian rioters who seized the cannons and muskets stored in its cellars to use against the Bastille later the same day. Napoleon was entombed under the dome of the Invalides with great ceremony in 1840. In December 1894 the degradation of Captain Alfred Dreyfus was held before the main building, while his subsequent rehabilitation ceremony took place in a courtyard of the complex in 1906. The building retained its primary function of a retirement home and hospital for military veterans (invalides) until the early twentieth century. In 1872 the musée d'artillerie (Artillery Museum) was located within the building to be joined by the musée historique des armées (Historical Museum of the Armies) in 1896. The two institutions were merged to form the present musée de l'armée in 1905. At the same time the veterans in residence were dispersed to smaller centres outside Paris. The reason was that the adoption of a mainly conscript army, after 1872, meant a substantial reduction in the numbers of veterans having the twenty or more years of military service formerly required to enter the Hôpital des Invalides. The building accordingly became too large for its original purpose. The modern complex does however still include the facilities detailed below for about a hundred elderly or incapacitated former soldiers. 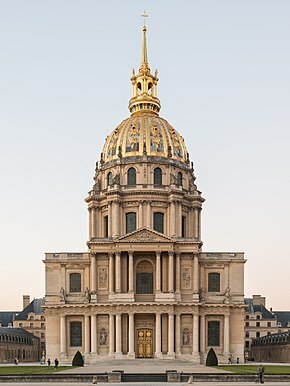 On the north front of Les Invalides, Hardouin-Mansart's chapel dome is large enough to dominate the long façade, yet harmonizes with Bruant's door under an arched pediment. 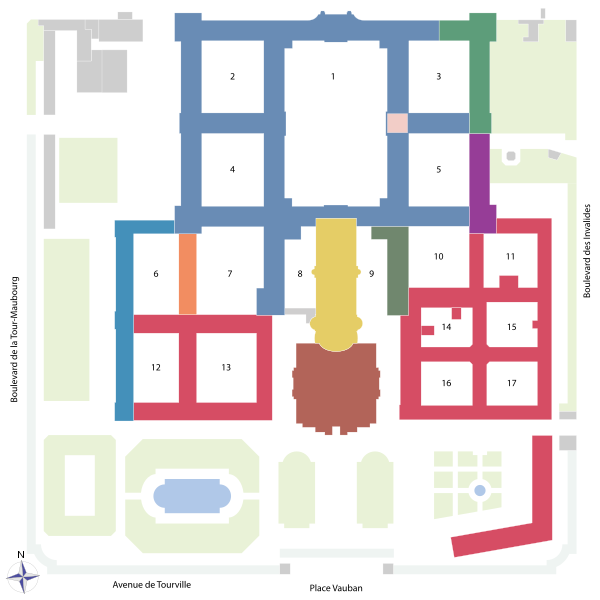 To the north, the courtyard (cour d'honneur) is extended by a wide public esplanade (Esplanade des Invalides) where the embassies of Austria and Finland are neighbors of the French Ministry of Foreign Affairs, all forming one of the grand open spaces in the heart of Paris. At its far end, the Pont Alexandre III links this grand urbanistic axis with the Petit Palais and the Grand Palais. The Pont des Invalides is next, downstream the Seine river. a centre for external medical consultations. The Dôme des Invalides, 107 metres (351 ft) tall and decorated with 12.65 kilograms (27.9 lb) of gold leaf, is an important landmark in Paris. In 1676, Jules Hardouin-Mansart was commissioned to construct a place of worship on the site. He designed a building which combined a royal chapel (now Dôme des Invalides) with a veterans' chapel (now Cathedral of Saint-Louis des Invalides). In this way, the King and his soldiers could attend mass simultaneously, while entering the place of worship though different entrances, as prescribed by court etiquette. This separation was reinforced in the 19th century with the erection of the tomb of Napoleon I, the creation of the two separate altars and then with the construction of a glass wall between the two chapels. When the Army Museum at Les Invalides was founded in 1905, the veterans' chapel was placed under its administrative control. 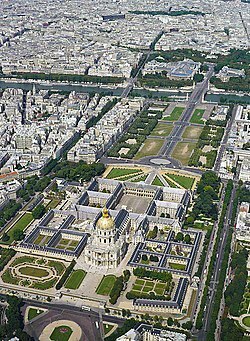 It is now the cathedral of the Diocese of the French Armed Forces, officially known as Cathédrale Saint-Louis-des-Invalides. The Dôme des Invalides (originally Chapelle royale des Invalides) is a large former church in the centre of the Les Invalides complex, 107 metres (351 ft) high. The dôme was designated to become Napoleon's funeral place by a law dated 10 June 1840. Ousted in 1815 by the allied armies, Napoleon had stayed so popular in France that Louis-Philippe, the King of France from 1830 to 1848, returned his "ashes" in 1840. (His "ashes" mean his "mortal remains"; Napoleon was not cremated.) The excavation and erection of the crypt, which heavily modified the interior of the domed church, took twenty years to complete and was finished in 1861. Inspired by St. Peter's Basilica in Rome, the original for all baroque domes, the Dôme des Invalides is one of the triumphs of French Baroque architecture. Mansart raised its drum with an attic storey over its main cornice, and employed the paired columns motif in his more complicated rhythmic theme. The general programme is sculptural but tightly integrated, rich but balanced, consistently carried through, capping its vertical thrust firmly with a ribbed and hemispherical dome. 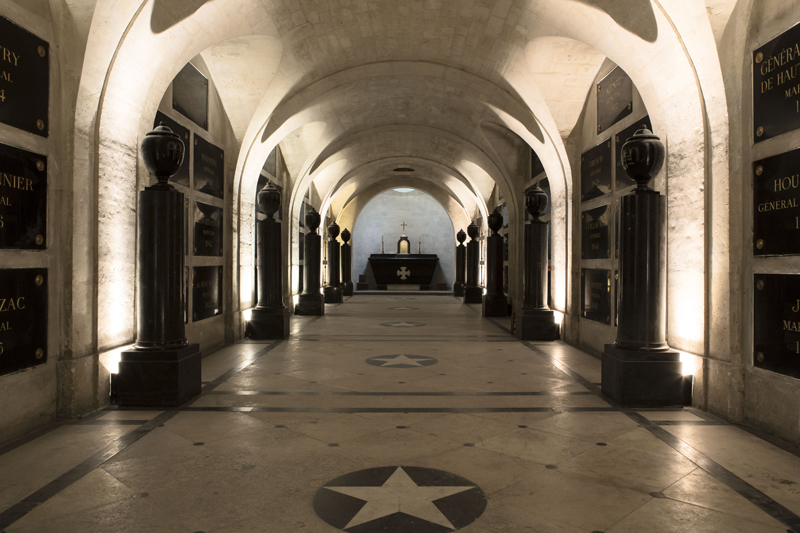 The domed chapel is centrally placed to dominate the court of honour. The interior of the dome was painted by Le Brun's disciple Charles de La Fosse with a Baroque illusion of space (sotto in su) seen from below. The painting was completed in 1705. The most notable tomb at Les Invalides is that of Napoleon Bonaparte (1769–1821). Napoleon was initially interred on Saint Helena, but King Louis Philippe arranged for his remains to be brought to France in 1840, an event known as le retour des cendres. Napoléon's remains were first buried in the Chapelle Saint-Jérôme in the Invalides until his final resting place, a tomb made of red quartzite and resting on a green granite base, was finished in 1861. Henri Gatien Bertrand (1773–1844), army general during the First French Empire who accompanied Napoleon to Elba and then St Helena. He brought Napoleon's body back to France in 1840. Joseph Bonaparte (1768–1844), Napoleon's elder brother. Jérôme Bonaparte (1784–1860), Napoleon's youngest brother. Henri de la Tour d'Auvergne, Vicomte de Turenne (1611–1675), better known as Turenne, Marshal General of France under Louis XIV and one of France's greatest military leaders. Vauban's heart (1633–1707), designer of Louis XIV's military fortifications. Géraud Duroc (1774–1813), general who fought with Napoleon. Thomas Bugeaud (1784–1849), Marshal of France and conqueror of Algeria. François Canrobert (1809–1895), Marshal of France. Claude Joseph Rouget de Lisle (1760–1836), army captain, author of France's national anthem, "La Marseillaise". Ferdinand Foch (1851–1929), Marshal of France, Allied Supreme Commander in the First World War. Pierre Auguste Roques (1856–1920), founder of the French Air Force and Minister of War in 1916. Marshal Lyautey (1854–1934), Marshal of France and colonial administrator. Philippe Leclerc de Hauteclocque (1902–1947), Marshal of France, hero of World War II, commander of the famous 2nd Armored Division. Jean de Lattre de Tassigny (1889–1952), Marshal of France, commander of the French First Army during World War II and later commander in the First Indochina War (memorial only). ^ "Paris facts". Paris Digest. 2018. Retrieved 2018-09-19. ^ "The Paris Army Museum - Hôtel des Invalides". citibreak.fr. Archived from the original on 27 February 2015. Retrieved 29 September 2016. ^ "Institution Nationale des Invalides". Archived from the original on 31 August 2011. ^ "Napoleon's tomb facts". Retrieved September 1, 2018. ^ "Apotheosis of Saint Louis - Musée de l'Armée". www.musee-armee.fr. Retrieved 2017-01-27. This page is based on the Wikipedia article Les Invalides; it is used under the Creative Commons Attribution-ShareAlike 3.0 Unported License (CC-BY-SA). You may redistribute it, verbatim or modified, providing that you comply with the terms of the CC-BY-SA.